They received their awards on Homecoming weekend, September 22, 2017. 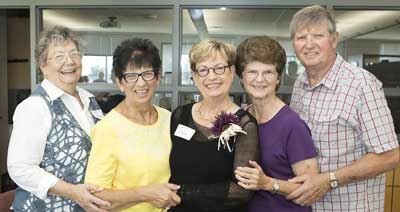 Hall of Fame Events took place on Friday, September 22. The public was invited to attend the Alumni Association Awards Ceremony at 9:00 am in the Mount Vernon High School Gym. Following the ceremony, a Reception was held in the High School Library. The public was also invited to attend the afternoon Homecoming Pep Rally. Friday evening, September 22 was the President’s Hall of Fame Reception, the Homecoming Game and presentation of Alumni Award Winners during halftime at the Football Field, and the All-Alumni-Community Reception ‘Tailgating Under The Tent’ at the top of the bleachers. The Mustangs won over Northeast Goose Lake. The Alumni-Community Reception tent was open from approximately 6 pm until after the game. In addition, student events included the Thursday evening Parade and Crowning of the Homecoming Queen and King and the Powderpuff Game, and their Saturday Homecoming Dance.